How can Sony and Nintendo possibly trump Microsoft? The same question keeps popping up: "how can Sony and Nintendo possibly top this?" Microsoft's E3 press conference started out as a parade of games most people either knew or strongly suspect were happening. Then, towards the end, they dropped the bombshell to end all bombshells. Project Natal, a sky-high ambitious body/face/voice recognition add-on for the Xbox 360 that, if it works as promised, changes not just the 360, not just gaming, but how humankind interfaces with technology. 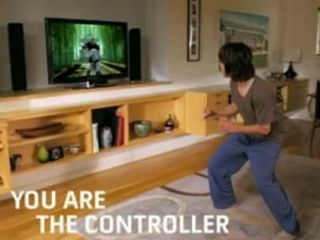 Rumours had swirled for a while that Microsoft, jealous of the Wii's success with non-traditional gamers, was about to reveal some sort of motion sensing device for their own console. Project Natal would seem to stem from that jealousy, but it goes much, much further than the expected response/rip-off. In another world, Natal would be a whole new console of its own – that Microsoft has gone to such R&D lengths for the now relatively elderly 360 proves how desperate it is to win this round of the console wars. And with good cause – this is the generation of console that's most poised to climb beyond being mere game-boxes. There's the PS3 with its Blu-Ray drive, and the 360's own movie downloads – about to be improved further with mooted instant-play 1080p high-def streams – and even the Wii's music, photo and browser applications. 1080p STREAMS: As well as HD insta-streaming (via variable bitrates), you can host virtual film nights- inviting your friends' avatars to appear as an on-screen audience. The time is right for the living room omni-device, and that reveals the real purpose of Project Natal – Microsoft are finally making their own PC, or rather a ground-up-reworked alternative to the venerable IBM-compatible. Natal may well enable all manner of fun body-popping games that are comparable to the Wii's line-up but with the controller replaced by camera-based recognition of gestures. But it was its use as an operating system that really reveals the startling scale of this project. With a wave of the hand, blades of the 360's dashboard UI and pages of photos are shuffled through, or items grabbed and moved to other parts of the screen. Video chat uses facial recognition. Movies are controlled by voice – no remote required. Microsoft's own Windows 7 team, working on the next iteration of the desktop operating system, must be feeling pretty hard-done by right now: their own company has utterly overshadowed them. But probably not as hard done by as the poor Tony Hawk's Ride team, who trotted onto stage earlier in the conference to show off their new skateboard controller. Half an hour later, we see a kid playing a skateboarding game without any controller whatsoever – only Natal's all-seeing eye. FACEBOOK 360: Does Facebook and Twitter support make the 360 the iPhone of the living room? As well as Natal was the revelation of built-in Facebook and Twitter support for the 360 – and again, if this all works, it really does seem like an all-out assault on the PC. Socialising, multimedia and gaming are three of the major pillars supporting the modern computer. TWITTER INTEGRATION: The Twitter and Facebook apps are tightly integrated with the 360's Avatar system, which could cause something of a schism between 360 social-networkers and PC ones. If there's now a device that does all this, in the living room and on your big telly, and without the need for any input device bar your own body, we could be in for a truly profound change in the man-machine relationship. Really, the only thing holding back massive future-shock at this point is Microsoft's long-tradition of not getting exciting things quite right. Until the press at large gets to try and report on Natal first-hand, the world will keep spinning as always. Meantime, pity Sony and Nintendo – right now, they must be feeling a little like they're the follow-up act after Jesus fed the five thousand.